"Dr. Fedeli has created an amazing center of healing." "Dr. Ken and Dr. Fideli are amazing at relieving people of chronic back pain." "Dr. Fedeli is a master healer on many different levels." "Dr. Fedeli is a wonderful teacher and brings a caring energy to his patients." "I highly recommend this practice for achieving and maintaining wellness." "This is the place to go for fast and effective help." "I love The Balancing Center!" "The Balancing Center has transformed my life and helped alleviate my neck and back pain." "My outlook on life has changed completely since seeing Dr. Dan, Dr. Ken, and Dr. Taka!" "I highly recommend The Balancing Center to everyone!" If you are ready to feel better, get healthy and enjoy life more fully, we can design a care plan to help get you there. Located in the Gold Coast neighborhood of Chicago, The Balancing Center is a unique, one-of-a-kind chiropractic office that offers a variety of incredibly specialized therapeutic techniques. Our chiropractors use a holistic approach to wellness that looks at the body as a self-correcting system. We believe that the body is made to be well, and our job is to help you unlock the quality of life that you already have. Through balancing your body with the N.U.C.C.A. upper cervical chiropractic adjustment, supporting the transition to wellness with energetic techniques such as B.E.S.T., and helping you integrate your progress into your daily life through Foundational Movement Practices (F.M.P. ), we will not only bring you back to wellness, we’ll help keep you there. The Balancing Center was established by Dr. Daniel J. Fedeli in 1987 to bring innovative and forward-thinking alternative health care to Chicago. The practice is designed to treat each patient from a physical, mental, and emotional angle, providing a comprehensive approach that helps with both acute and chronic conditions. Dr. Fedeli is joined by Dr. Kenneth Bennett, and both doctors emphasize treatments that work with the human body, rather than working against it. Their techniques pave the way for the human body’s incredible powers to self-correct and heal. The doctors use several innovative techniques, including the National Upper Cervical Chiropractic Association, or NUCCA, method, which concentrates on the top vertebra to better align the connection between the spine and the central nervous system. In addition, the doctors use BEST (bio energetic synchronization technique) to restore balance, NET (neuro emotional technique) to address conditioned stress responses, and FMP (foundational movement practices) to improve posture and alignment. Using these techniques, the doctors at The Balancing Center treat everything from musculoskeletal issues, like neck and back pain, to endocrine and immune system disorders. They work with patients of all ages, including small children, who tolerate the noninvasive treatments very well. 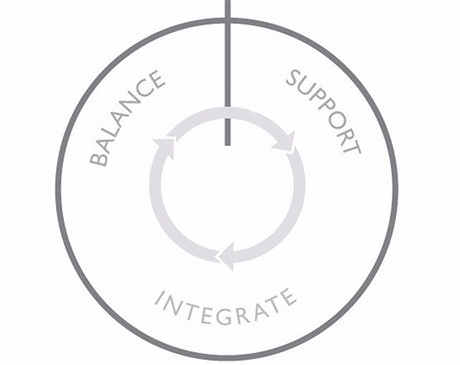 At The Balancing Center, the team provides long-term support programs to facilitate growth, healing, and positive change. They provide resources for nutrition, diet, and ergonomic protocols, along with an understanding of how to stabilize and move the body during exercise and yoga. As a result, patients are better able to care for themselves, ensuring long-term health and wellness. "My experience with The Balancing Center has been great, from the receptionist to the doctors." "I trust Dr. Fedeli and Dr. Ken completely. I have experienced a wonderful and positive change in my body and neck." "Always have an amazing and life changing to visit with Dr. Daniel and everyone at The Balancing Center!" "Dr. Daniel Fedeli and his protégés at The Balancing Center are truly healing geniuses." "I highly recommend The Balancing Center to anyone pursuing balance in their life, a solution to pain or a great massage!" "Dr. Dan is the best chiropractor in Chicagoland. I travel 50 miles one way to be taken care of at the Balancing Center. Much better than any ordinary chiropractor." "Dr. Fedeli is experienced far beyond typical chiropractors. His methods are unique and have solved seemingly unrelated problems." "Dr. Ken is amazing! I feel lightyears better after only a few initial visits. I cannot wait to continue to improve while working towering maintaining alignment." "Dr. Dan at The Balancing Center fixed what my physician couldn't figure out. For years, I had suffered from migraines and had neck pain." "Dr. Ken is a magician. He really knows where I'm hurting before I even tell him. I appreciate his attention to detail and how he takes so much time adjusting my back."